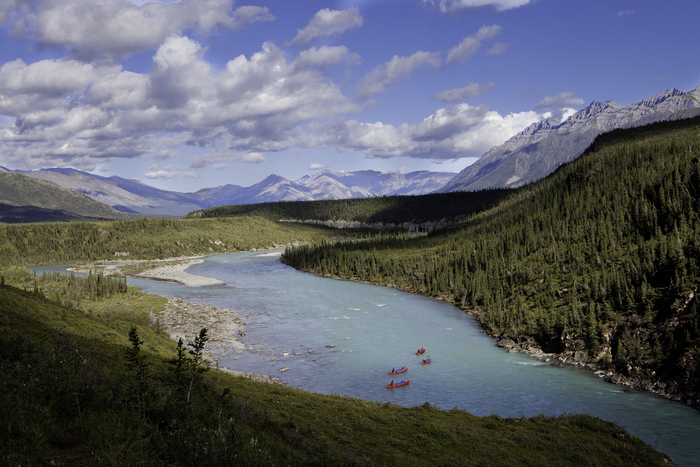 The Yukon’s Snake River is one of the true gems of the Peel River Watershed. Paddling it is the trip of a lifetime. And all who experience come back changed. “Right draw, right draw!” yells Al Pace from the stern. “We’ve got some rocks in play here… follow the vee,” he continues. I’m bow-paddling and commentary is constant. “Oh! Awesome!” he cries as we round a bend in the splashy, rippling, roaring white water. 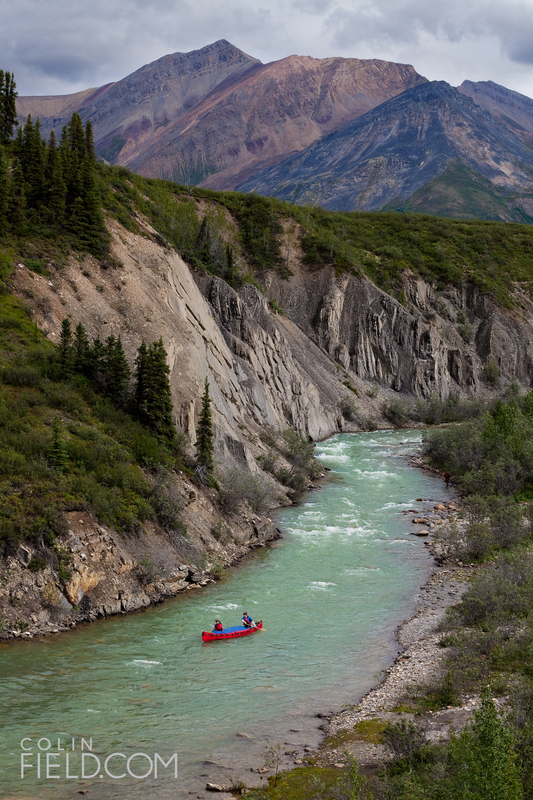 Where the Yukon’s Snake River is rushing, this dialogue is endless. It’s entertaining, hilarious, but most importantly, it’s fun. 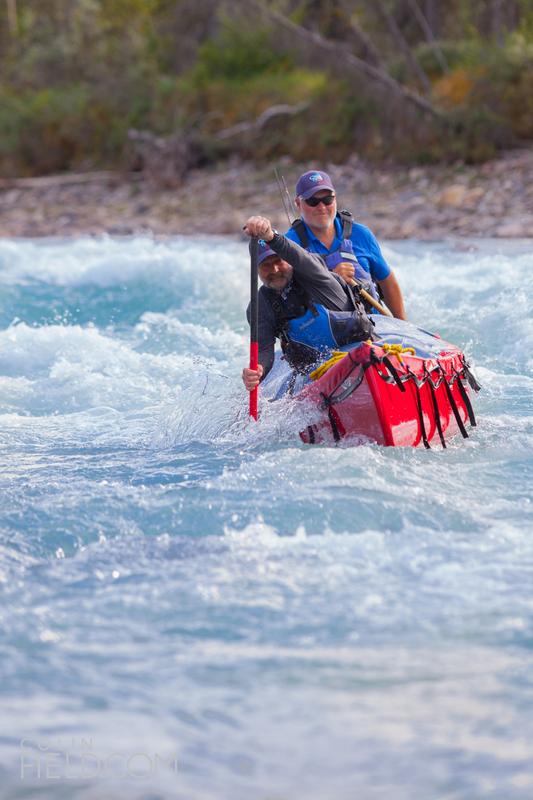 Paddling whitewater in a canoe is a seriously good time. Three days earlier I wasn’t sure I was skilled enough to paddle class-three rapids in a canoe. But with a skilled sternsman, anyone can do it. Hell, from a bowman’s standpoint, as far as I can tell, it’s easy. I began this 12-day trip down the Snake with 11 complete strangers. I didn’t know a thing about the river. I learned we’ll cover 300 kilometres and drop 1100 metres from high alpine to arctic plain by the time we reach the take-out at the Peel River. There is no road, no cell service and no wireless access. The only sign of civilization we’ll see is the occasional jet contrail 30,000 feet up. We got to the Snake River by floatplane: the spectacular Twin Otter flight from Norman Wells, NWT, took us over the MacKenzie Mountains, and gave us a glimpse of the beauty, ruggedness and remoteness of the terrain. We landed on Duo Lakes a short portage from the put-in. Beneath snowcapped peaks we set up our tents and tarps, secured the canoes, ecstatic at the locale. With almost never-ending sunlight, we made intimate small talk; social barriers cut down knowing we had 11 more days together. This was Yu Ling’s TK trip with CNA. A professor from Toronto, she was instantly philosophical about this adventure. For me, as a person who wasn’t sure about my ability to paddle the water, or endure this long in the bush with strangers, being open was mandatory. But then again, being open applies to anyone who would put themselves in a position such as this. Al Pace is a bear of a man. He wears a bright blue t-shirt and navy blue shorts the entire trip and in my mind’s eye, his doppelganger is the Skipper from Gilligan’s Island. With bright blue eyes, gray hair and an optimistic smile, he’s no stranger to these parts. He’s been here before. Many times. The fearless leader and mastermind behind Canoe North Adventures, he spends winters in Ontario’s Hockley Valley running his Farmhouse Pottery Studio, while in the summer he’s in the North guiding or running CNA with his wife Lin and 21-year-old son Taylor. Al spends the minimum of 45 days in the backcountry each season sleeping in a tent, on a thermarest, every single one of those nights. He’s never dumped a canoe and I’m told, when someone else does, he springs into action like a limber-footed caribou. Which he most certainly is not. He says it a lot. And it says a lot about Al. Because even with 11 people relying on him for safety, guidance and hell, survival, that answer, “There is no plan,” is somehow comforting. 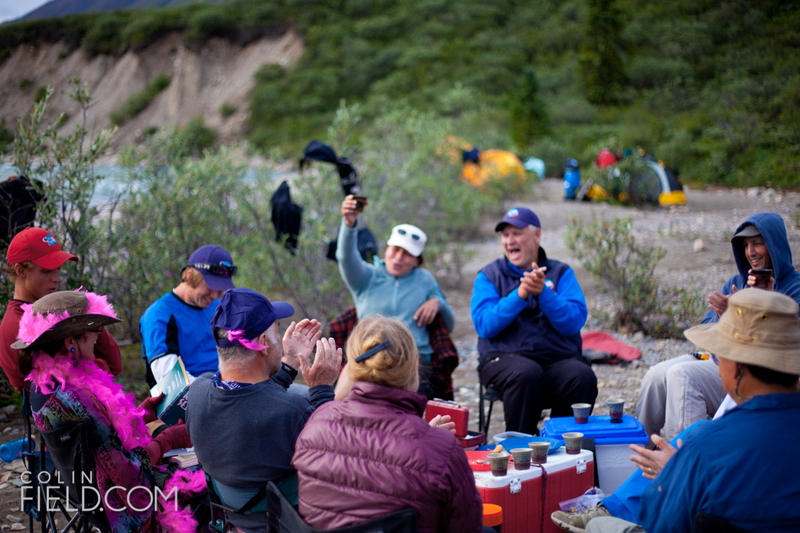 Pace is flexible enough to respond to changing weather, high-maintenance clients or grizzlies as few good leaders are. He is a man of patience and reason and if you ever had any problem in the wilderness, Al would solve it. He is a humble guide in a world where guides, by their very nature and position, tend to be anything but. 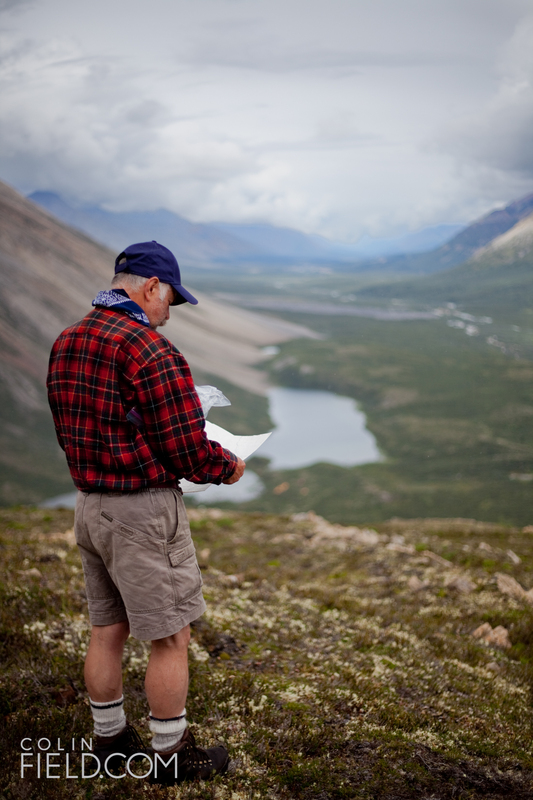 His first trip in the Northwest Territories was on the Coppermine River in 1977. He’s been coming up here ever since. In the summer of 2011 CNA completed their Canoe Centre in Norman Wells, Northwest Territories. Right beside North Wright Airways, the Centre is impeccably located to access the Sahtu Region: there are 11 rivers accessible from here. Al figures it’s a good place to set up an outfitting company. But it isn’t about the money. One of the women with us is Wendy Cecil. At 62, she’s the oldest. This is her tenth year tripping with CNA; she’s been on so many trips with them she’s like a company mascot. 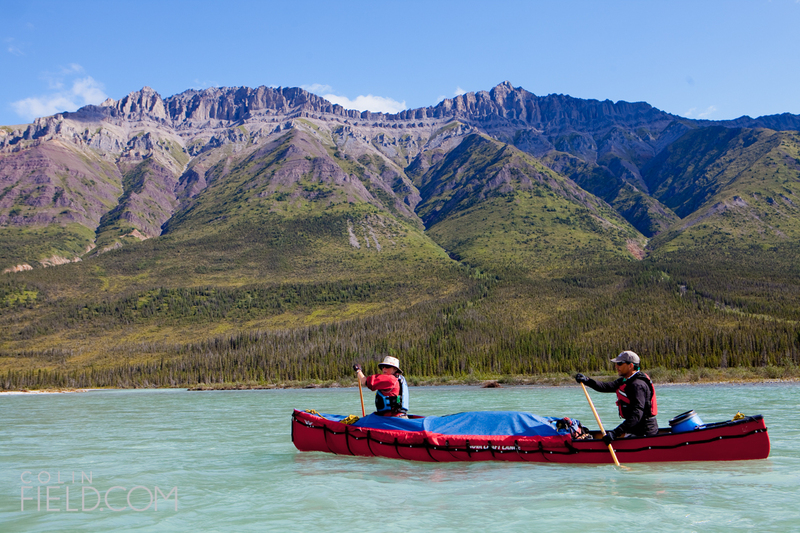 Her first experience, at age 52, was with her two sons on the Yukon River. Her impetus for such an unlikely trip came via poetry. So when she pops out of her tent five days down the Snake River, a pink boa draped around her neck and two Nalgenes full of black Russian, we sit around the campfire and listen to her read “The Cremation of Sam Magee,” knowing how powerfully these words have shaped her life. And I can’t help but agree. I imagine my family experiencing the Snake River as they drag my ashes here and I feel bliss at the guaranteed togetherness the experience would bring them. It’s a morbid, yet wonderful thought. It’s day eight and the perfection of the 12-day trip is just hitting me. Day-to-day reality has completely disappeared; I forget about work, mortgage payments, insurance and taxes. I forget about car payments, the price of gas and social media. And what I end up with is a new understanding of what I value in life. I develop a sense of peace and a focused vision that is rare in this age of 140-character text bites. These improbable friends will more than likely drift out of my life once the trip is over, which is a sad but inevitable truth, but what I take away is a fresh understanding of self. Of my values, my strengths, my desires. Everyone on the trip apart from me is a repeat customer. And every one of them says, “The first trip was a once-in-a-lifetime trip.” And I know what they mean. Anyone who has been to the North will tell you it’s special. They’ll say there’s just something about it. Some kind of unspeakable magic. Perhaps it’s the vastness, the emptiness, the size, the beauty, pick your cliché, someone has said it. But the thing is, it’s true. There is something special up here. There are no words for it. The North inspires awe in a way like nowhere else. Combine that with the expertise of CNA and the characters they take on every trip and I have to admit, you’d be hard pressed not to have a profound experience on the Snake River. I know I did. And I’ll be back up there as soon as possible.